I'm not in town to check out the opening of the Berlin Biennale. 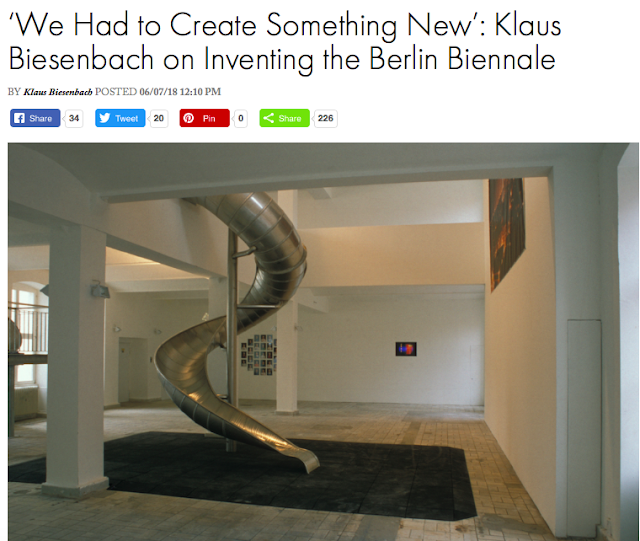 But luckily I follow Klaus Biesenbach on Instagram, where I saw he visited the Hello World exhibition at Hamburger Bahnhof and, rightly so, called it the worst exhibition title ever. And now Klaus Biesenbach has also written down his memories about the 1990s when he founded the Berlin Biennale. Mainly his memories consists of him saying how he worked together with all these artists that time has proven to be "important." I 've written before about the Importance of Being an Important Artist. "Famous" in Biesenbach's dictionary equals mainstream, think of Carsten Höller and Olafur Eliasson, or "the avant-garde of today is the salon art of tomorrow." Biesenbach remembers meeting Jonathan Meese, and apparently finds it to be a touching scene that demonstrates Jonathan Meese's dedication to the arts (aka its system of hierarchies). It made me feel sick to the stomach. A friend of mine found a new term for it: "Hyperaffirmatives Superschleim." "He left after we finished meeting, and then came back and said, “Oh, I don’t know if I was really saying goodbye, and I just want to thank you for the time I spent discussing my work. I know it’s performance based. I know there’s not much to see in a studio, but I just wanted to thank you for the opportunity to explain my work.” So, he left again, went perhaps 30 feet, and came back to basically say the same thing. So we were very appreciative, and thanked him profusely, and reassured him that it was a great visit. Then he would go again, and he would go perhaps 45 feet, and he would come back and do the same and the same and the same. The whole goodbye at some point seemed longer than the conversation we had had before. This was actually such a convincing, over-the-top gesture, and Jonathan became a fixture in our community and his work became a very important part of the Biennale."